4x4 EVO 2 - Welcome to the dirt-grinding, real world of racing Off-roading in the new adventure system puts your racing skills to the test, as you explore, rescue, and compete through 3 new career modes. Pick a base truck to compete in a series of off-road races and win fast cash to deck out your truck with a an inventory of over 90 real-world parts to increase your power. Experience the wild, off-road adventures of 4x4 EVO 2 in over 32 expansive, outdoor courses set in a variety of diverse locations around the world. Trek into unpredictable, jaw-dropping environments and diverse mission-based adventures ranging from locating a downed plane in the Grand Canyon to the discovery of a lost Mayan city in a Central American jungle. 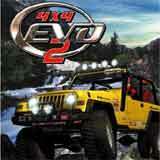 4x4 EVO2 roars onto the Xbox™ video game system as a first-wave launch title this Fall. 70+ masterfully detailed Sport Utility Vehicles (SUVs) and 4x4s put you in control of a high horsepower, multi-thousand pound beast, with such a realistic physics control system, the terrain is no longer beautiful scenery, it is the enemy. Professional drivers get paid by winning races and so do you. In career mode, you must win races to acquire 'fast cash' so the multitude of enhancements and upgrades available can be made to your base truck, taking you to a higher level of racing respect. Plow through snow packed roads, bust out from a wall of fog and be blinded by oncoming rain. There is no off-season for a true off-road race champion. Catch ALL the rip-roaring action from film-quality multiple camera angles: cockpit, chase close, chase far, dash, television camera, sides, front, ground, sliding, and even blimp views. Your beefed-up Jeep Grand Cherokee rumbles, roars and screeches in Dolby 5.1 surround sound. You'll be amazed to find yourself in your living room!